Something Amiss is an online adventure game created by Tucker Bowen to promote his book of the same name. It has a distinctly classic Lucas Arts adventure flair with surprisingly good visuals. Two chapters have been released so far and Tucker has incorporated user feedback to make the experience as satisfying as possible. The first chapter sets the stage and has you trapped in a dark, mysterious laboratory. Search the lab for clues to why you're alone and try to find a way out. It's a very short chapter and there isn't very much to do, but it's a good introduction to the series and gets you yearning for the next installment. Also, you'll need to remember a password at the end of Chapter 1 so you can play Chapter 2. The second chapter in Something Amiss fleshes out everything that made the first one good and cleans up quite a few of the interface issues. After escaping the MRI room, Alice discovers she's no longer in Washington D.C., instead she's lost in the jungle. There's a lot more to explore in this chapter and the puzzles are more intricate. To play the games, simply use the cursor to guide Alice around the environments. When you see an object you'd like to examine, use, or talk to, click and hold over it to bring up a small menu. A handy save feature is available for both titles, just hit the [esc] key any time during play. Analysis: Something Amiss does a great job taking the classic adventure formula and turning it into a casual online experience. The story is filled with mystery, though it feels a tad cliche at times. It's early, though, and I feel there will be a lot of surprises in store. Some players have experienced a few minor interface glitches, so make sure you have the latest version of Flash and try a different browser if you continue to have problems. 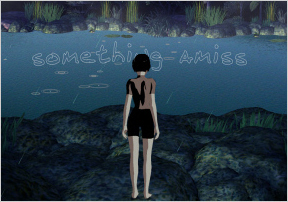 Something Amiss: <br />Chapters 1 and 2 Walkthrough now available! Take the coin attached to the MRI machine. Use the coin to remove the screws in the grate on the wall. Crawl through the grate to the computer room. Pick up the tape recorder. Pick up the hard drive. Return to the MRI room through the grate. Use the grate to pry open the loose floor tile. Pick up the cable under the floor. Use the power cable with the hard drive. Plug the hard drive and cable into the wall socket. The door opens. Exit through the door and you're out! Here's a walkthrough for Something Amiss, Chapter 2. Completion password from Chapter 1: Zebra. Look at the journal hidden in the trees. Take the banana from the tree just outside the MRI room. Exit forest at the bottom. Talk to the sick woman in the bed. Twice. Take the medicine from the cabinet. Exit left, then exit the forest at the top. Take the branch on the tree. Peel the banana and put the sedatives into it. Give to the gorilla. Exit toward the bright light at the top. Use the stick on the fire to make a torch. Pick up the hollow log. Exit the cave. Exit to the right of the sleeping gorilla. Use the log on the river and enter river. Go left to the temple. Turn the stone wheel to open gate. Exit through gate on the right. Note the carved digits: 7531246. Turn wheel to point to outline square. Turn wheel to outline star and exit left. Turn wheel to open circle. Exit right to medical cave. Go back through and set the wheels as follows: Circle to outline, star to full, square to full. Exit temple ruins, back down river, past the gorilla, back to the cave. Pick up the rock behind the trees (the spider is gone). Pick up the white mushrooms under the rock. Use the rope with the crevice and exit down. Exit the medical cave. Exit the passageways. Go down the ladder to the temple pillars. Push the Roman numerals in the same order as the numbers carved in the room with the square wheel. Backtrack out of the room, past the columns, up the ladder, and back to the medical cave. Exit up the rope and untie it. Exit the cave, go back left. Read the hidden journal again for good measure. Exit to the sick woman's room. Look at the soggy map. It says to always travel east to get to the Heart of the Jungle. You now see everything from the first person point of view. Use the compass to determine east. Go right. Use the compass. Go left. Use the compass. Go straight. Use the compass. Go right. Use the medical tape on the bug. Pick up the bug. Exit the Heart of the Jungle and backtrack to the river. Go right down the river. Use the ripe with the red flowers on the cliff at the waterfall. Go back to the sick woman. Use the ingredients with the empty bowl: White mushrooms, indigo beetle, and red flowers. Use the rock on the pot with all the ingredients. Use bowl of goo with the sick woman. Look at the rock/window behind you. Talk to the woman again. Twice. Exit down and you're out! I've got the grate opened, picked up the hard drive, and listened to the tape recorder. What now? Check the floor of the room you were first in. Never mind got the password. Everything else is good with me for anyone who needs help. I can't find the bug! not really sure why this game was picked. it's so obvious it's been created in haste just for the book promotion. low quality. thumbs down. Woah I actually finished it. You actually don't need a triangle gate, if there ever was one. I didn't use it. ho humm.. Maybe I should write a walkthrough? I think the first game was maybe shoddy, but it got me interested enough for the second, which is much better. I have the white mushrooms and the beetle, plus a rock to grind them with in the bowl, but I can't get the flowers from the cliff. Anybody finished that can help me? I'm pretty sure there isn't one. You don't need it. The beetle's in the heart of the jungle (east), but you'll need a compass. Also, dials can close some gates while opening others. I've found the bug, but can't pick it up! What am I missing? Well you don't get a whipp but what's the next best thing? Ever hear of the "roach motel"? Did you collect everything from the supply area with the three colors of mushrooms? you need the medical tape. Now where did you get a WHOLE BUNCH of Medical Items? chunli, thanks. Frustratingly obvious, but isn't that always the way? I liked the ending of the second chapter. Look forward to the sequels - maybe a bit less buggy? I've been everywhere.. but where is the compass? They cannot be opened, and are not required to solve this chapter. I'm also posting a hint guide in a couple of days if you get really stuck. Amber: if you haven't found the compass, then you haven't been everywhere. The diary tells you the general location of the compass - keep exploring. It's big and obvious on the floor of the room it's in. How do you get to the room where the compass is at? I've tried and tried to get to that friggin ladder but I can't figure it out. - the loading time between scenes can get really frustrating, and it probably says more about us as (impatient) players than your programming talent. I'm not a programmer, so I don't know if these transitions can be made faster. It's unfortunate; the waiting detracts from the gameplay flow. - the animation of Alice, the gorilla, and other moving objects (fire, river) is lovely and smooth (perhaps a bit slow, but there's that impatient player speaking up again!) Yet I was struck by how artificial the woman in the bed seemed when compared to the other elements. Actually, I thought I was going to discover I had been speaking with a robot (and wouldn't that have been a neat little plot twist!) Perhaps she needs a little tweaking? In all, a really nice example of point-and-click gameplay. I look forward to seeing chapter 3 soon. There is more than one way to go into the ruins. You have to have outline circle and solid square set. You need to climb down the cave that is dark. If that isn't enough, read chunli99's comment at 5 PM on Mar. 30th. You don't really "poison" the gorilla, that's prabably against the law...you "drug" him. And...where do you think the drugs would be? Get sedatives from the cabinet in the woman's room. Then peel the banana and combine sedatives and banana. the white mushrooms and the rock. Could someone tell me where they are? wow, I never thought that it was so easy! This game is a bit more fun now. You seem to like your "worthless red herring" elements. Nice. Wandering around, I get the sense that I'm on the set of Lost, except that everything isn't trying to kill me. Yet. Anyway, I can't seem to find either the rock or the correct kind of mushrooms. Am I blind? I am kind of stuck. I have been able to get down the ladder. suposed to solve the runes puzzle? Esc doesn't save the game, at least for me. And if you're me, you won't find this out until you're at the end and the game freezes. Arghhh. Can't get to level 2, it just took hours to load..
Can someone please tell me where to find torch ? and also how to access ladder , if its required. I have got the rope and picked have been to that medicine cave.Thanks. Wow that was very good! I love adventure kind of games and this was right up my street. A great game, had me puzzling at moments - loved the "red herrings", very well made game and great plot, cant wait for the 3rd chapter! Where else have you seen a 7 digit number? These numbers aren't just any ordinary phone number. At the square dial, you will see a 7 digit number. Push these numbers in that order in the passage. If you did everything correct, you should see a new opening. Don't forget to go in there! You will need to find something that can act as a torch. What are the base necessities for a torch? A wooden stick can be found in front of the dark cave (You will need to do some hunting around) and a fire can be found near the gorella. Of course, that would mean that you will need to ensure you can get past the gorella first. As for the ladder part, I won't answer. Wait until you get the torch and can climb down into the crevice, and then see what you can think of. uuuggghhh i'm stuck i need to get the darn rope can someone help? I got into the hall with the Roman numerals, but no compass, help? Okay, I know by know that you have to be facing east in the Jungle to get the bug, but where the heck is the bug on the freaking screen? I've tried putting the tape down on the log, but whenever I move my cursor out of the inventory, it converts back into a directional arrow. What should I do? Also, the compass is acting kind of weird, and told me I was facing south twice when I was finding my direction. Did it do that for everyone else? If anyone can help me i was wondering if anyone else was having a problem with going in certain directions in the heart of the jungle...for some reason when i click to go in a direction it returns me to the previous screen. Can anyone help me out here? look at the floor near the stone collem in the room that appears when you press the roman numberals and if its not there maybe you already took it and if you dont have it and its not there well... all i can say is restart the game or load from a previous save. To get the rope move the stone dial with the star to the star that is not filled in but make sure that you switch the square one to then it should be open so you can get the rope and get to the circle dial. NOTE: the rope is used for getting the red flowers from the water fall and its used to go down the cave. for example if the needle is facing north you would go east and if the needle is facing south you would go west. wow cool twist....i finaly beat it cant wait for the second one. I don't know how to get down to that silly ladder in the place with all those wheels. someone help meh! Great game, the thing that happened at the end of the chapter was pretty interesting. Cheers Anon for your help. Got eveything but the white mushroom, got red, black and orange mushrooms but can't for my life find the white one's!! Please use sparingly...its more fun to figure out on your own isn't it? yahoo! I can play level 2! But I am stucked at the moment!!! There is more ways to be in the dark than just a cave. Like under a rock, for example. If you still can't figure where I'm talking about, it's in FRONT of the dark cave. Which does remind me--it'd be *really* nice to have some sort of 'instructions' screen that mentions, in particular, that pressing and *holding* the left button over an object will bring up a 'talk/look/use' menu (well, set of icons, but the same thing)....noone mentioned this, and I was stuck badly on the *first* chapter until I figured that out. oh shoot. that was good. i JUST finished it (chapter two). i'm excited for the next one! I was just wondering, does anybody know when chapter 3 will be out??? This *is* a point and click right? Because I'm on chapter 1 and NOTHING is reacting when I click. Only thing happening is a woman walking around the room staring at things. Are there ways to pick up things or examine things using keys? There is a help section that explains how to play the game and control Alice. Just click on the "help" button at the top right corner of the screen. I finally figured it out. That style of game-playing is certainly not intuitive. Why no help menu at the beginning? I love this type of games, but this one just left me with a "meh" feeling. I am at odds why, though. The graphics are good, although the movement of the characters and some of the animations are really amateurish. But that's not what is really wrong with this game. I kinda don't like the puzzles. The worst bit is manipulating those gates - no feedback, no apparent logic and confusing perspective make this easy puzzle downright irritating. Top that with the fact you have to traverse five-six locations between tries, it really misses the mark. I am still gonna check out Chapter 3. But so far, even though a lot of work has seemingly been put into this, I am not that excited with the result. You need to find a power cord... but this said cord is well hidden. In fact, its underneath the floor. You need to use the grate on a loose tile to reveal this said prize. You know how to access inventory, right? Well, you need to HOLD down the left button on the compass when you are in the jungle, and then pull it onto the left button that pops up (it should look like a hand) in order to use it. Oh yeah, you have to depend on the compass: directions are not normal here. Try using the coin on the grate. i can't find the compas, just i can't! hi can anyone help? I can't find the fungus!!! Thanks everyone for your comments on the game. I appreciate your honesty...it helps me in making the subsequent chapters better. So if there's anything else that really bothered you about the game...or that you liked, please let me know. I pay attention to the feedback. I just wanted to say that I really like this game and am looking forward to subsequent chapters. This is the first game of it's kind that i've beaten (almost) without a walkthrough. The only part I had trouble with was finding the room to get the compass, but that was due to my lack of realizing there's more than one room off of the main entrance of the fort. Great job thus far! Wow, this was really a great game! I had the trouble of looking for the stick and also how to look at the compass (now I can know how to use one). The rests were easy to manage! The ending was far more suprising in chapter 2. I am waiting for chapter 3 to come out soon. Great game! I thought that for once the puzzles were very logical. I like that it required no hunt-and-click. Looking forward to installment 3. It's my first one, so don't be too strict. When you exit the lab, you have to find an expedition journal, to get acquainted with what you are supposed to do. 1. Go down and talk to the sick lady until she fells into a coma (sounds great:)) Take there sedatives from the cabinet. Go up. You may take the soda near the lady's bed - but it won't be needed. 4. Approach the monkey with your small present - banana + pills. After it fells asleep go up, were the light is. 5. Put your stick into the fire and make a torch. Grab the log. 6. Put the log into the water when you are on the bank of the river (to the right from the monkey). Now you can go up/down the current. Get on the log and go to the left. 7. You see a gecko. Forget it till the level 3 is ready. Go to the left again. 8. You are in the dead/lost (or how do you call it) city. Turn the wheel (star). Go to the right into the pass, which opens. 9. Memorize the numbers carved on the rock - 7531246. Turn the other wheel (square). Go back and turn the wheel (star) again. Then go to the left. 15. Go to the room with the circle-wheel and go down the stairs there. It will be possible only if you have closed all the gates, as it was told. 15. Dial the combination that was carved on the rock (7531246) and enter the secret pass. Pick up the compass and go back to the entrance of the cave. 16. Hallelujah! The spider is gone. Take the rock, where it was and the white mushroom. Go to the lady. There you shod go to the right to the jungle. 17. Find the bug in the heart of the jungle with the help of the compass (always go east) (right-left-left-up-right-up). Catch it with the sticky medical tape and get back to the lady again. argh!!! i finished it (finally!!). it's a brilliant game and i can't wait till the 3rd game comes out!! This may be a really stupid question but how do I peel the banana??? I really like this one! The way the character actually moves around the screen reminds me of Pricilla Gone Missing. It's also challenging but not so stumping that I have to look at spoilers. someone please describe where it is please. Sandra, I'm pretty sure it's on the right side, between two other ones (One and three, I think). 'IV'. Jimun, have you tried looking to see what the options for using the banana are? can some plz help me with grates? Good game - thanks! Sort of like Submachine, but I liked the "verb wheel" - good idea! Also, great site Jay! I am now a point'n'click master! Why can't I see the options to pick up objects or talk to people? This gets worse, Got through grate took some stuff and tried to go back to main room and half of screen isn't showing, it's black......!!! After decades and decades I have finally completed the game...excuse me but I have to leave now, I have to collect my pension...I was in my 20's when I started this game....hahaha...pretty good game, gets the brain cells working. can't wait for three to come out. All I get is a black screen. The game seems to load, but then there's nothing. Pity, it sounds like a fun game. You must have at least Flash 8 to play. 9 is better. Also, the game works best on Firefox. If you're still having trouble try emptying your browser and reloading. I am using Firefox and I have Flash 9. I eventually got the game to load, but could only play part 1. After that I got the "in between screen," but clicking on "Play part 2" (the button on the bottom) had no effect. I enjoyed part 1, so I guess I'll try to see if I can get to part 2 some other time. Hey, this is a great game, but I have had to resort to the hints and this page to help me find the compass. I have pushed the numbers on the pillars with the code, I hear the windy noise, but darned if I can find this secret passage that holds the compass. I have re-entered the code a few times, and still no compass in sight. Is there a glitch? Help!! please SOS, this is driving me crazy! Where is this secret passage with the compass in it? If you hear the windy noise and there's no passageway you must have pushed the numbers in the wrong order. After the windy noise push the buttons in the correct order and the entrance should appear. It's fairly obvious when it opens. Great game! I've the two chapters. I want to finish all the chapters who will be released soon! Thanks for playing. I really want to release Chapter 3 but work has been relentless lately, and I just haven't had any time. I hope after the holidays things lighten up a bit and I'll have more chances to finish it. Nice one Tucker, Im really enjoying this game, can't wait for the next chapter. BTW how many chapters are planned? I think I'm going to make Chapter 3 the grande finale of the 'Something Amiss' series. I've realized it's too difficult to keep releasing chapters in a timely manner. I'll still be making adventure games in the future (already got a few ideas) they'll just be standalones so the player doesn't feel stranded on a cliffhanger. Nothing wrong with a good cliffhanger. It's good to hear you're making more adventure games, Something Amiss is the best point and click I've played since the Chzo Mythos quad and I'm definitely looking forward to more games of this quality. This is how point and click adventures are meant to be. Cheers. Here's a teaser for Chapter 3. Summer can't come quick enough. The gorrila will not load!!!!! Not that I had any trouble with the puzzle per se, rather when I tried to leave. I was unable to do so because the gate to leave the maze was raised, and I could not climb back up the rope. I'm hard at work on chapter 3. It will come out this summer as forecast. As usual, I had to up the ante and make it even bigger than chapter 2, so it's taken me a lot longer than I initially anticipated. But I think you'll find it worth the wait...at least I hope so. How do you access chapter two? I just finished chapter one and I'm just sitting on the page showing the "welcome to chapter 2" title. I've reloaded the game too, to see if that fixes it. I'm in Firefox, using Flash 9 and I see I'm not the only one with this problem. cenovis - You need the password from the end of chapter 1. Tucker - How's Chapter 3 coming along? I see you've "upped the ante" sounds promising. Looking forward to it more than ever. Ahh, ok. I'm one of those people that has to find out *why* not to do something. So I pressed an arrow key when it told me not to while it was loading. And now it is broken. Help? Thanks for playing the game and your patience with an occasional long wait time. (I believe my host provider went down for a little while in September.) If the game gives you any trouble try refreshing your browser's cache. That usually helps. Chapter 3 is finished and is undergoing extensive beta testing. I hope to release it near the end of October 2008. So you won't have much longer to wait for the final installment. I don't know if anyone here has ever played Sherwood, a non-register MMORPG made by Maid Marian productions (or whatever they are called) - anyway, some of the music is definitely the same as the dungeon music. I just thought it was a wicked cool comparison to make. LOL. I know it's been a while since anyone posted here, but if anyone is out there who reads this and has any idea, would be great to know if it has been released and is working. I really enjoyed playing Chapter 2, seemed to be no glitches whatsoever. Really well put together in terms of graphics, sounds and storyline. Chapter 2 seems to be down. Any chance of it coming back? I enjoyed the first chapter, short though it was, and like others have said I found it very intuitive. The gameplay mechanic is well done, and the puzzles actually made sense. Too many point and click games make you hunt for pixels and do absolutely ridiculous things to proceed, necessitating a reliance on walkthroughs or just plain giving up in frustration. If more games in the genre were more like this one, I'd play them more. talking to the woman and deciding to go hack the mainframe for evidence. Now i'm at where the mainframe is but i cannot get to it, and other tunnels are either blocked or guarded. bowl of noodles, chopsticks, blanket, key, id card, thumbdrive, scrap of paper, medical syringe, map. Anyone played this yet? Help? in the middle of a glacier with no way to get into a shelter that needs its hinges thawed. I need fire! episode 2 and 3 no longer loads. it just sits there at the very beginning. I tried this on ie and google chrome. anyone else getting this too? Hello! I just tried both links and they load fine for me in Firefox. Make sure your browser is updated and your flash player as well, and try clearing your cache. If that doesn't work, you'll need to contact the developer, as we don't host the games on our site and so can't troubleshoot any connection issues. actually I got it to work but 2 or 3 times in the middle of the ghame it froze and as it doesn't save I had to restart the game again. I don't know what's going on. but anyway, thanks dora.